The story of the LESCOTA Matekela library began with the opening of the MACOBICA library in Maguu. The Hagati Valley. Matekela Village is on the first hill. Maguu village sits to the right of the frame (out of picture). Lake Malawi is behind the most distant hills and is obscured by clouds. Matekela village rests on a narrow plateau in the Hagati Valley, about 10 kilometers south of Maguu, the location of the MACOBICA library. Since its opening in 2010, students have trekked long distances to the MACOBICA library to utilize its informational and study resources. One former student who was particularly inspired by this project was Mr. Maurus Nchimbi who was born in the region. 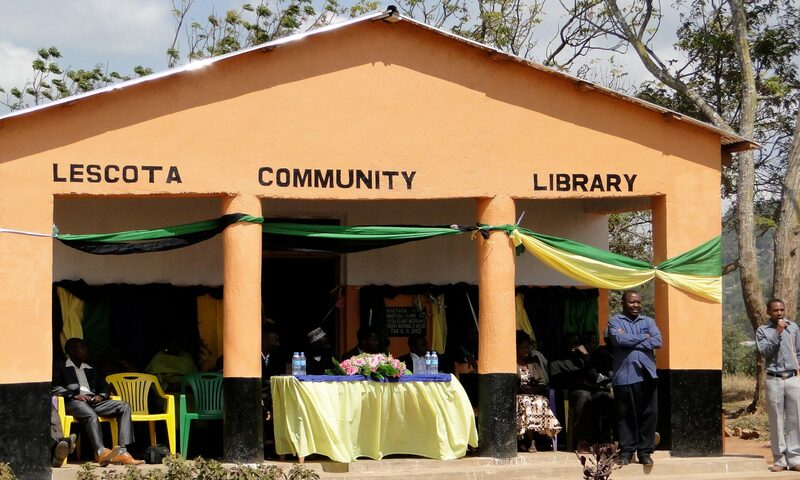 Recognizing the impact of the MACOBICA library and the potential to reach an additional demographic of Tanzanians, Maurus organized the Matekela village community to construct their own community library on the primary school grounds of Matekela Village. 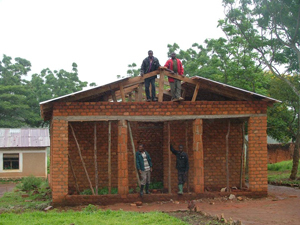 Local Carpenters of Matekela village during the construction of the LESCOTA library, March 2013. While student educational materials are an essential component of the library, the LESCOTA Matekela model emphasizes providing Swahili materials that are accessible to not only students, but to all wakes of the community. Through a collaborated effort of Tanzanian donations and fundraising through US donors, the library has over 1,000 books written by the Tanzanian and Kenyan Swahili population. These books range from Swahili children’s literature, folklore, and vocational skills like farming techniques, carpentry, animal husbandry, and rural health issues, to name a few. It is with books like these that the LESCOTA Matekela library hopes to encourage a “reading culture” for the whole community while providing educational materials to students. Recognizing the success of its first full-year of operation, TETEA has chosen to partner with the LESCOTA Matekela library. Donations to the library pay for the monthly salary of our librarian Mary Mbungu, who has a degree in Library Studies. Donations are also used to purchase additional supplies such as books and supplies, as they are needed.